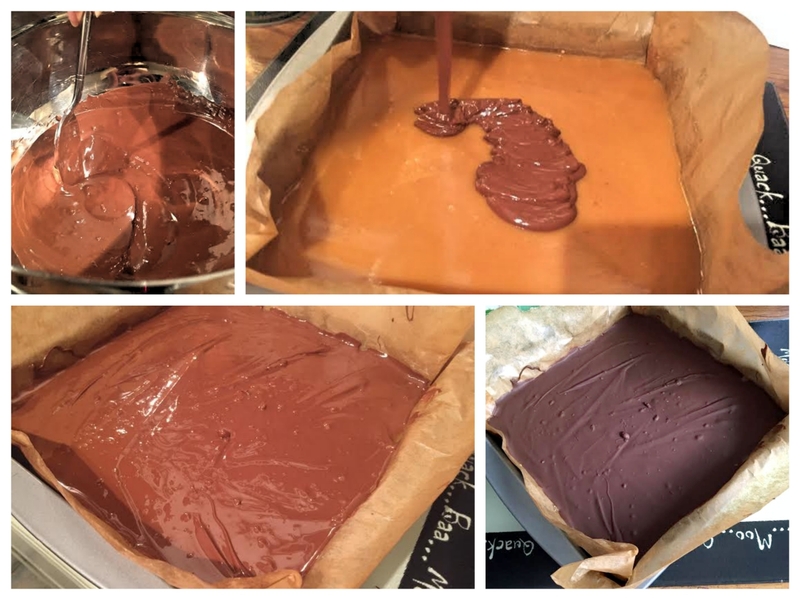 We’ve been busy in the kitchen this week creating a number of treats for Nial’s birthday including our popular chocolate brownies, German biscuits, and a new recipe, salted caramel squares. Nial took the collection of goodies into his work and shared with the guys at The Tomorrow Lab who seemed to more than enjoy them (if the empty boxes that returned home are anything to go by 🙂 ). 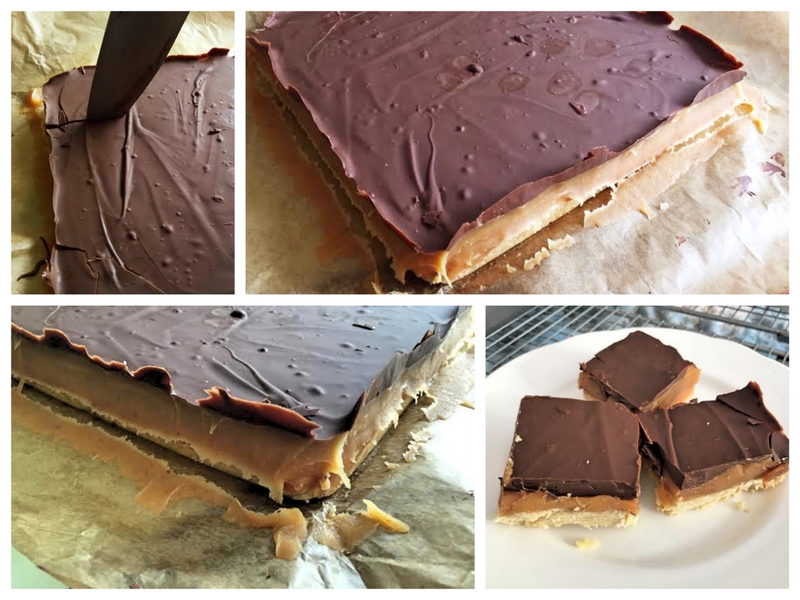 Below we share the simple steps to recreating the salted caramel squares (one of Nial’s favourites). 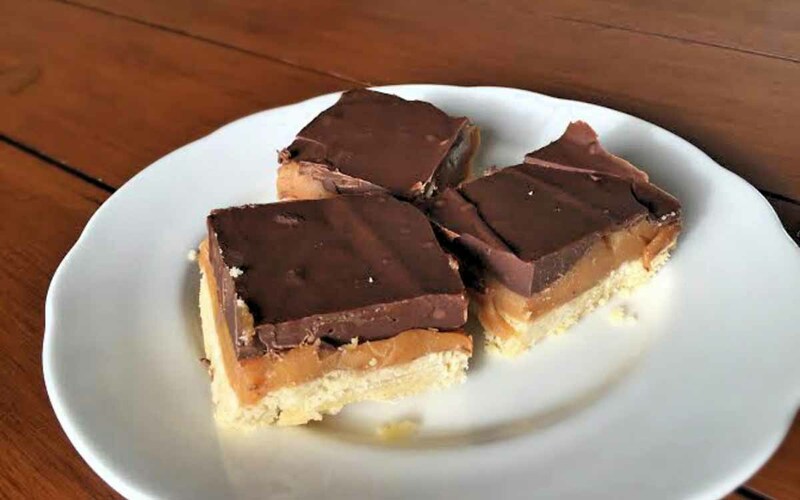 So whether you’ve a kids party coming up or you’re just looking to try out something new in the kitchen this is a simple recipe to get stuck into, and they taste bloody awesome even if we do say so ourselves. The addition of ground almonds to the biscuit base adds a lovely crumb-like texture. Using a mixture of smooth milk and bitter dark chocolate helps to balance the sweet. salty caramel. Try them out and let us know how you get on. Pre-heat the oven to 180C (fan oven) and line a 20cm square tin. Add the butter, sugar, flour, ground almonds and vanilla seeds to a bowl and rub together until you make a rough, crumble like dough. Add the dough to the prepared tin and press all over with your fingers until level. Prick the base all over with a fork to prevent it from rising. Bake for 5 minutes and then reduce the heat to 150C and bake for a further 35 minutes. Remove from oven and allow to cool in the tin. Now begin making the salted caramel. Add the unsalted butter, condensed milk, golden syrup and salt to a saucepan and bring to the boil over a low to medium heat for 10 minutes. Ensure you stir regularly to prevent the caramel from catching and burning. The caramel will become a nice golden fudge colour. 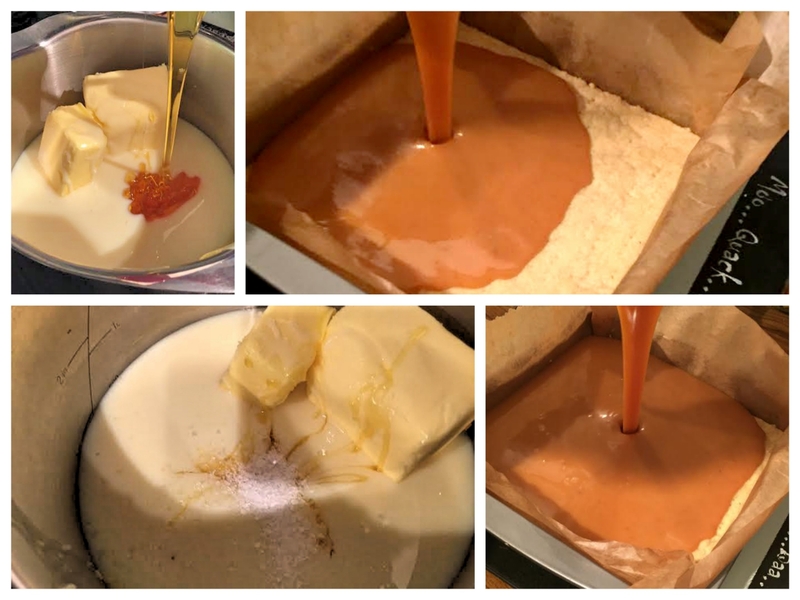 After 10 minutes remove salted caramel from the heat and pour it on top of the biscuit base. Place the tray into the fridge and chill for 25 – 30 minutes until the caramel has begun to set and you are ready to pour the chocolate. Melt the milk and dark chocolate in a bowl over a pan of simmering water. Ensure that the water does not touch the base of the bowl. Once melted, stir gently to mix both chocolates together helping to remove any existing lumps to achieve a smooth finish. Once your chocolate is ready, remove the salted caramel and biscuit mix from the fridge and pour the chocolate over the top. Spread the chocolate with a palette knife or spatula. 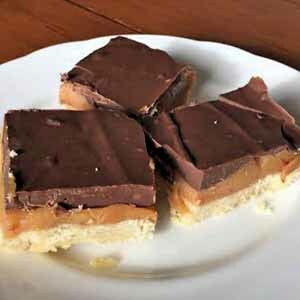 Chill the chocolate topped caramel biscuit in the fridge for a few hours until set (or preferably overnight). 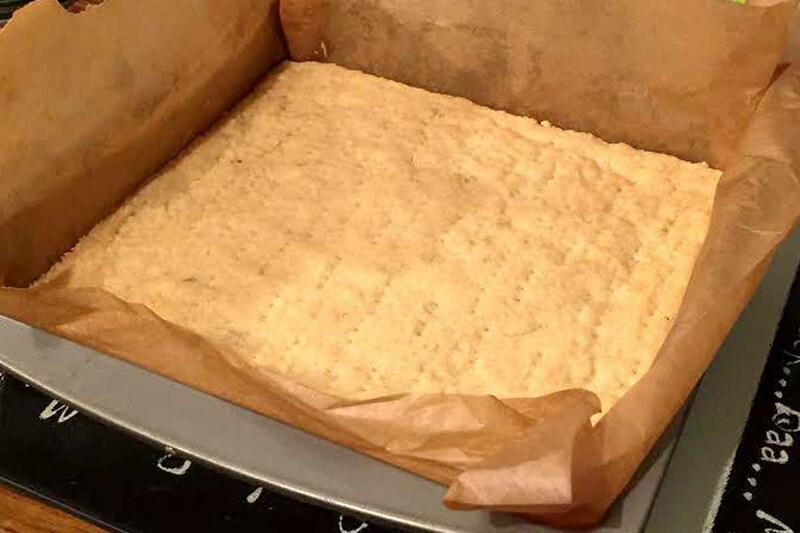 Before cutting, remove the tray bake from the fridge and allow to come to room temperature. Place a sharp knife in hot water for a few minutes before cutting into 16 squares (or how ever many pieces you wish to serve). Keep up to date with our latest recipes, reviews and travel stories by signing up to our newsletter at the top of the page. You can also connect with us on Facebook, Twitter and Instagram.